Yeshua, Mighty King, Precious Lamb, Defender, I worship you. Thank you, oh Lord, for strength to overcome trials and temptations. Thank you for helping me find peace within my mind, body and soul. Teach me, oh Father, to walk in truth daily, as I strive to deliver your word to your people. Protect me from false preachings. Help me to not fall prey to the subtleties of Lucifer. He is the king of lies and abides not in the truth. 2 John 1:4-6 I rejoiced greatly that I have found some of your children walking in truth, as we received commandment from the Father. And now I plead with you, lady, not as though I wrote a new commandment to you, but that which we have had from the beginning: that we love one another. This is love, that we walk according to His commandments. This is the commandment, that as you have heard from the beginning, you should walk in it. I want to always recognize your voice over his. Assist me, as I listen to You, to understand your teachings and exactly what you want me to do. Guide me as I decipher what are truths, based on the Bible, and which are lies, for I want to know your word, for it is my daily bread. Grant me wisdom to refuse the teachings of wolves in sheep clothing, and help me in living a righteous life, Adonai, for those who worship you must worship in spirit and in truth. Lord, there are many deceivers who have inhabited your land who confess not that Jesus Christ is come in flesh. They deny that the blood of the lamb cleanses us from sin. Jesus means Savior and Christ means Anointed one. To deny this is to deny the kingdom. For those that deny him will not see the face of our Heavenly Father. 2 John 1:7-8 For many deceivers have gone out into the world who do not confess Jesus Christ as coming in the flesh. This is a deceiver and an antichrist. Look to yourselves, that we do not lose those things we worked for, but that we may receive a full reward. 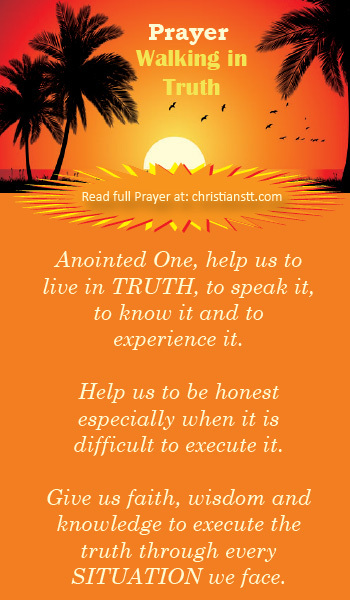 Anointed One, help me to live in truth, to speak it, to know it and to experience it. Empower me with honesty especially when it is difficult to execute it. Help me to realize the truth will always set me free while a lie will always continue to grow. Give me faith, wisdom and knowledge to execute the truth through every situation I face. In Jesus mighty name I pray, Amen!